The capability to carefully control and guide the path of an underground pilot bore is what has made horizontal directional drilling (HDD) a primary method of installing underground utilities. Indeed, HDD often is the only practical and in some instances the only possible way to bury pipe, conduit, or duct. While the drill unit provides the force to make the pilot bore and pull product back through it, the guidance system is the key to success or failure to complete a pilot bore. Job requirements vary and in some cases there is some flexibility with how precisely a bore must be controlled. Other times, there is no tolerance for deviation from the planned bore path. A good example of such a project is one recently completed by Triumph Cabling Systems, LLC, for the Port of Houston. 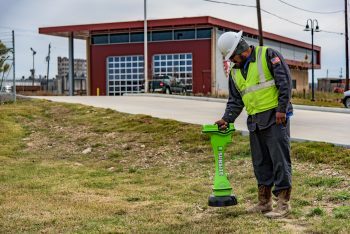 HDD was used to install two four-inch diameter conduits for 144- and 72-strand single-mode fiber optic cable from an existing manhole to a fire station. Keeping the pilot bore on line to the designated exit point was critical because the Triumph crew had to work in very congested areas with gas, power, and water lines and a sprinkler system, said Henry Garcia, Triumph president. The Toro Company To Acquire The Charles Machine Works, Inc.